CHENNAI: Several Chennai-specific plant species that once thrived in the city are now seen only in reserve forests or have already become extinct due to urbanisation and lack of intervention, highlighted taxonomist Muthu Karthik of Care Earth Trust at the first day of Chennai Water Forum organised by Goethe Institut in Kalakshetra. While some invasive species like water hyacinths are doing well, varieties of the insectivorous sun dew plants, ground orchids and bladderworts are now only found in Nanmangalam, Pulikaradu. Edible species like Kottikazhangu — a tuber and a wetland herb — are also becoming rare, according to Muthu Karthik. “Beach and dune vegetation that have important ecological functions are largely neglected,” he said. The second day focused on microbeads that would eventually wipe out biodiversity. “These inconspicuous beads used in everyday items such as facewashes and toothpastes can wreak havoc,” insisted R Nagendaran, professor at Anna University. Microbeads, that are less than 5 mm, are polyethylene and polypropylene spheres with low density and are also non-biodegradable. “Microbeads find their way into water bodies through the sewage. Even if the sewage treatment is 100% efficient, microbeads will flow untouched,” he said. The UK parliament’s environmental audit committee reports that a single shower can result in one lakh plastic particles being washed down the drain. Eventually these plastic microbeads are ingested by the fish and by eating fish, it enters human bodies. A Swedish University’s study this June pointed out how young fish like eating microbeads just like how teenagers like eating fast food. The microbead discussion has gained global traction but has not taken off in the country as yet. Countries like the US had banned microbeads in 2015 while the UK government has pledged to ban it by 2017. The final day of the forum shed light on water, particularly focusing on rains, floods, and lakes. The release of water from Chembarambakkam Lake is a small matter when compared to the other things that happened during last year’s floods. 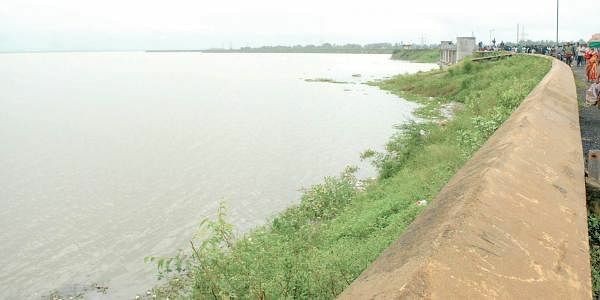 Micro-drainage systems like storm water drains played a big role, said IIT-M Civil Engineering department Professors Balaji Narasimhan and SM Bhallamudi. They spoke on ‘Lessons learnt from Chennai Floods 2015’, stating that micro-drainage are of paramount importance since they are instrumental in connecting to larger drains. A year on, the scenario remains the same. According to Prof Balaji, roads should ideally be designed to facilitate drainage and not just for transport. But in Chennai, since the roads are not milled, over a period of time the levels are raised in a way that water from the roads will flow into houses. “This is not how drainage in a modern city should be functioning. This is what we called ‘Polder effect’,” he said. The way forward, according to the experts, is Sustainable Urban Drainage System (SUDS) where natural systems are mimicked to collect, store and clean run-offs, and surface water before letting it out into natural drains. 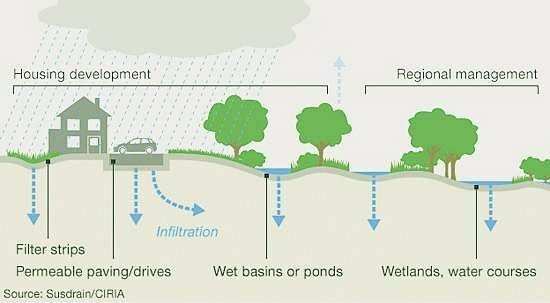 Natural contours are available to allow water to join the ground or let it evaporate from surface water, thereby reducing run-offs in an urban set up. History of Chennai’s rivers were also highlighted. In 1910, D’ Angelis, a baker of Corsican origin living in Chennai, built his own plane and flew it over Island Grounds. This was only seven years after the Wright Brothers built the first aeroplane. “This is perhaps the first plane in Asia, definitely the first in the country and was at the banks of Cooum,” said Ramakrishnan Venkatesh of Chennai Cooum Group. The first car, the first bus, and even the first railway track were on the banks of Cooum,he added. Padmapriya Bhaskaran of the same group spoke about temples along the course of the Cooum. Legend has it that Koyambedu, now a transport hub, was once a part of sage Valmiki’s ashram. There are interesting pieces of legend and folklore attached to the Mount Road Durgah too. “It is said that in the 17th century, when the British tired to demolish the mosque for a road-widening project, blood erupted from the structure and a collector who tried after that, dropped dead,” she said. The banks of the Adyar River had stories of their own. “The entirety of Ponniyin Selvan was written on its banks,” added Venkatesh.